The Jack Kilby Monument project received a tremendous boost May 24 when it was announced that an anonymous donor will contribute $150,000 to provide a matching incentive in providing funding for the monument, which will be built to honor the man who invented the microchip. To kick-start the generous offering, the first contribution toward that $150,000 match came by way of a $20,000 contribution from community leaders W.R. and Yvonne Robbins on behalf of themselves and Farmers Bank and Trust NA. If successful, the matching opportunity will provide $300,000 to the building of the monument. Prior donations of $75,000 will be added to that total, which will bring the amount raised close to the $400,000 projected cost to construct the monument on the west side of Jack Kilby Square. A committee to honor the soft-spoken engineer, who died in 2005, is working toward ensuring Great Bend never forgets the man whose integrated-circuit invention 50 years ago changed the world like no other invention before or since. “The Gift,” a bronze sculpture to honor Kilby, is planned for construction on the west side in the county’s courthouse square that already bears Kilby’s name. It has been projected that $400,000 will be needed to erect the monument. The Committee is chaired by local attorney Glenn Opie (620-793-5455, glennopie@ruraltel.net) and Barton County Historical Society director Beverly Komarek (620-793-5125, director@bartoncountymuseum.org) is serving as vice chair. 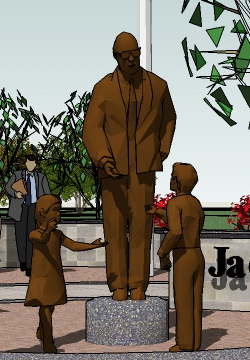 More information about the Jack Kilby monument project can be accessed at http://www.jackkilby.org. Those wanting to contribute to “The Gift” can mail checks to Great Bend Foundation, PO Drawer E, Great Bend, KS 67530. The donations are tax deductible and no tax dollars are going toward the project.